Therefore do not let sin reign in your mortal body, so that you obey its desires. Therefore, do not let sin rule your mortal bodies so that you obey their desires. Let not sin therefore reign in your mortal body in order to obey it, in its lusts. So, do not allow [the practice of] sin to rule your mortal bodies, so that you obey its desires. Therefore do not let sin reign in your mortal body, that you obey its passions. Let not sin therefore reign in your mortal body, by making you slaves to the lusts thereof. 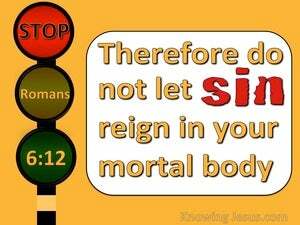 Let not sin therefore reign in your mortal body to obey its lusts. Therefore let not sin reign in your mortal body, to obey it in the desires thereof. Therefore do not let sin reign in your mortal body that ye should obey it in the lusts thereof. Therefore let not sin reign in your mortal body, to listen to it in its passions. Let not sin therefore reign in your mortal body, that you should obey it in its lusts. Let not sin reign therefore in your mortal bodies, that ye should thereunto obey in the lusts of it. Therefore let not sin rule as king in your mortal body, compelling you to obey its lusts. Let not therefore sin reign in your mortal body, that you should obey it in the passions thereof. Therefore do not let Sin reign in your mortal bodies and compel you to obey its cravings. Let not sin therefore reign in your mortal body, that ye should obey it in the lusts of it. Therefore don't let sin reign in your mortal body, that you should obey it in its lusts. Let not sin therefore reign in your mortal body, to obey it in the lusts thereof. My steps, direct thou by thy word, and let no iniquity, have dominion over me. But if ye do not dispossess the inhabitants of the land from before you, then shall it be. that they whom ye leave remaining of them will become pricks in your eyes, and thorns in your sides, and will harass you, concerning the land, wherein, ye are settling down. Wherefore also I said, I will not drive them out from before you, - but they shall be your adversaries, and, their gods, shall become unto you a snare. In order that - just as sin reigned in death, so, also, favour, might reign through righteousness unto life age-abiding, through Jesus Christ our Lord. If, moreover, the Spirit of him that raised Jesus from among the dead dwelleth in you, he that raised from among the dead Christ Jesus, shall make alive evenyour death-doomed bodies, through means of his indwelling Spirit within you. But put ye on the Lord Jesus Christ, and, for the flesh, take not forethought to fulfil its covetings. For this corruptible must needs clothe itself with incorruptibility, and this mortal, clothe itself, with immortality. And verily, we who are in the tent, do sigh, being weighed down, while yet we are not wishing to unclothe ourselves, but to clothe ourselves over, - in order that, what is mortal, may be swallowed up, by life. And, they who are of Christ Jesus, have crucified, the flesh, with its susceptibilities and covetings. But, from the youthful covetings, flee! and pursue righteousness, faith, love, peace, along with them who call upon the Lord out of a pure heart. For, even we, used, at one time, to be - thoughtless, unyielding, deceived, in servitude unto manifold covetings and pleasures, in malice and envy, leading on, detestable, hating one another. Whence wars and whence fightings among you? are they not from hence - due to your pleasures which are taking the field in your members? Be not loving the world, nor yet the things that are in the world: if anyone be loving the world, the love of the Father is not in him. These, are murmurers, complainers, according to their covetings, going on, - and, their mouth, speaketh great swelling words, - holding persons in admiration, for profit's sake. How that they used to say to you - In the last time, there shall be mockers, - according to their own ungodly covetings, going on.